TOKYO (AFP) – Japan mobilised 50,000 military and other rescue personnel Saturday to spearhead a Herculean rescue and recovery effort, a day after being hit by its most devastating quake and tsunami on record. US forces on Friday helped Japan rapidly react by delivering a cooling agent to a nuclear plant where malfunctions threatened a dangerous meltdown. Some 300-400 bodies were recovered in the city of 23,000 people, NHK quoted the military as saying, while police reportedly said 200-300 bodies had been found in the city of Sendai. In the quake-hit areas, 5.6 million households had no power Saturday and more than one million households were without water. Japan's military started its mass deployment Friday, when it dispatched 300 planes and an armada of 20 naval destroyers and other ships, while some 25 air force jets flew reconnaissance missions over the vast disaster zone. 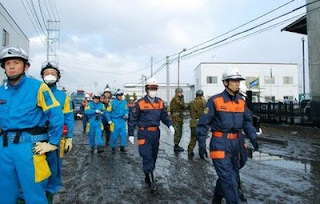 The Tokyo and Osaka police forces and the health ministry also all quickly dispatched medical and rescue teams. Among the international help pledged, a team from South Korea, with five rescue personnel and two sniffer dogs, jetted in. Japan said it had been offered help by scores of governments -- among them China, with whom Tokyo has sometimes awkward relations. The United States, which occupied Japan after World War II and is the country's main security ally, has many of its forces stationed on the southern island of Okinawa, far from the quake zone. Two aircraft carriers were en route to the disaster zone -- the USS George Washington, which is based near Tokyo, and the USS Ronald Reagan, which was on its way to South Korea for exercises and has been redirected.